Driving the Marine Park Drive, visitors will discover the breathtaking coastline of the St. Lawrence River. This picture was taken from Charlevoix, a place which attracts thousands of visitors every year. 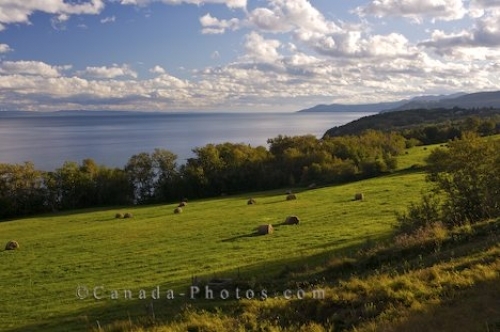 The region of Charlevoix, Quebec is beautiful where the scenery of the coastline of the St. Lawrence River highlights the area which is surrounded by mountainous landscapes and acres of farms. The main source of income in Charlevoix, a town of about 30,000, is farming, forestry and tourism. The farms along the coastline in this picture are beautifully tended to and bales of hay have been placed across the landscape for future use. The region was created by a meteorite that fell millions of years ago along with numerous earthquakes and glacial movement. The Marine Park Drive spans about 50 kilometers from Baie-Saint-Paul to La Malbaie where it winds along the coastline of the St. Lawrence River. Charlevoix is about an hour drive east from Quebec City and along the Marine Park Drive, visitors can stop at various viewpoints to admire the coastline. The scenery is breathtaking but the wildlife is plentiful where you can scan the surface of the the St. Lawrence River for various species of whales some which include the Humpback Whale, the Blue Whale and the Fin Whale. For hundreds of years, Charlevoix has inspired many artists, photographers and painters with its natural beauty. Picture of the scenery of the St. Lawrence River coastline along the Marine Park Drive in Charlevoix, Quebec in Canada. Coastline of the St Lawrence River along the Marine Park Drive, Highway 138, Charlevoix, Quebec, Canada.